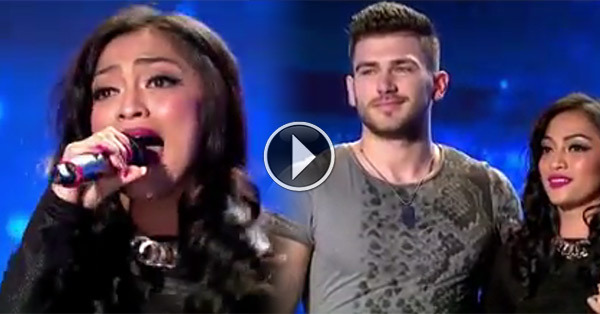 Filipina singer Resciebelle Santiago has received a standing ovation from the judges and studio audience in Romania's Got Talent competition. During the auditions, she belted out the Whitney Houston hit "I Will Always Love You" and brought some goosebumps to television and online viewers. All Romanii Au Talent judges were amazed with Santiago's voice they gave her a standing ovation and four Yeses, which means she will advance to the next round of the popular talent search. In a short conversation with the judges, Santiago revealed that she went to Romania for a two-week vacation. It was a coincidence that there was an open audition so her Romanian boyfriend convinced her to join. A video of her performance has gone viral via social media over the weekend, garnering millions of views after being posted by several Facebook pages. It got the attention of netizens, particularly female overseas Filipino workers, not only because of Santiago's amazing voice but also because of her hunk boyfriend. One of the judges even said she's giving her a Yes only if she would bring her handsome boyfriend in the next round. For those who find her unfamiliar, Resciebelle Santiago is known for her cover songs on YouTube and participation as contestant in the popular singing contest called "Pinoy Pop Superstar" which was hosted by 'Asia's Songbird' Regine Velasquez.